This discussion includes criteria and inspection actions that, when used either separately or in combination, will indicate whether adequate cathodic protection of a metallic piping system has been achieved. 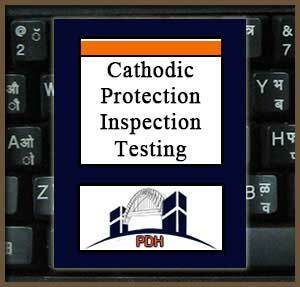 The effectiveness of cathodic protection or other corrosion control measures can be affirmed by visual observation, measurements of pipe wall thickness, or by use of internal inspection devices. Because such methods sometimes are not practical, meeting any criterion or combination of criteria in this chapter is evidence that adequate cathodic protection has been achieved. When excavations are made for any purpose, the pipe should be inspected for evidence of corrosion and/or coating condition. Apply sound engineering practices to determine the methods and frequency of testing required to satisfy these criteria. The criteria in this discussion have been developed through laboratory experiments and/or verified by evaluating data obtained from successfully operated cathodic protection systems. Situations may exist where a single criterion for evaluating the effectiveness of cathodic protection may not be satisfactory for all conditions. Often a combination of criteria is needed for a single structure. Learn about anode bed inspection and testing for impressed current cathodic protection systems. This course is intended for civil engineers, structural engineers, mechanical engineers, electrical engineers and other design and construction professionals wanting an introduction to the principles of inspection and testing of cathodic protection systems. This course will give professional engineers and others an introduction to the principles and practices that are the basis of corrosion protection system testing and inspection. This is an introduction to cathodic protection inspection and testing techniques for galvanic and impressed current systems. This course will give you an introduction to principles of cathodic protection systems inspection and testing.